There seems to be a new way to propagate a virus using the UPS system for tracking your parcel. I received both of these email messages within a couple of hours of each other. This is a poor attempt at a scam. The originators yahoo email address is exposed, the spelling is poor, and the To:line shows multiple addresses.The Zip file is the same size in each, there is no corporate branding on either email and the spelling leaves a lot to be desired. Take your user account out of the Administrators group.The default account when you first get your machine is in the Administrators group. Create a separate account called admin, and protect it with a password. You will be prompted every time something needs to have administrative access to your machine, whether an update or a fix – or a worm. Stopping and checking – before you allow access will minimise your chances of introducing malware. Eileen is a social media strategist and consultant at Amastra, a columnist at ZDNet and author of Working The Crowd: Social Media Marketing for Business. Contact Eileen to find out how she can elevate your brand and help your business become more social. This entry was posted in Scam and tagged email, Scam, spam virus on September 17, 2013 by eileenb. I regularly get requests to connect with people on LinkedIn. Sometimes they want to hire me, sometimes they want to follow my updates or try to access my other connections to connect on through. 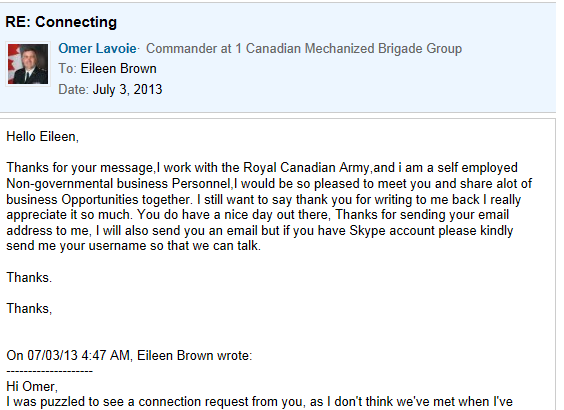 But today I got a request from Omar Lavoie, a commander in the Canadian Army. His credentials were very impressive indeed. Intrigued, I looked at his profile. I replied to his connection request and asked where we had met. I also connected with him out of pure curiosity and waited for his response to my initial message. I then became suspicious that the ‘real’ Omer Lavoie’s account had been cloned and I was getting messages from someone quite different to the person I expected to hear from. Why on earth would a Commander in the Army change jobs to become a ‘self-employed non-governmental business personnel’? I checked out Omer Lavoie on LinkedIn and i was not surprised at all to find two Omer Lavoie accounts. the name was the same names and so were the profile images. One was the account I’d just connected to and another at my 3rd degree level connection. My 3rd level connection Omer had actually been working at 1 Canadian Mechanized Brigade but he stopped that role in June 2012. My first level connection is doing that job now. 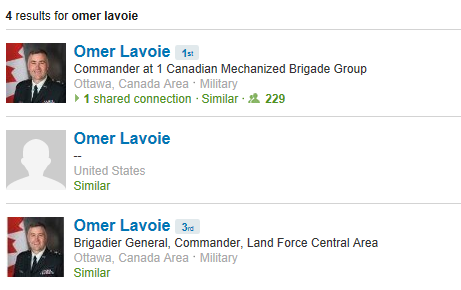 Brigadier General Lavoie has had his LinkedIn profile cloned by someone who is using his account profile to connect with a variety of people around the world. The cloned account has some strange connections – non of them connected to the army. But I’m puzzled. Why should someone want to clone an existing account and use this account to reach out to my connections? Why use someone well know, easily contactable and high profile? Why use the naive language exhorting me to chat by Skype? The army has proper conferencing facilities. What is this person’s agenda for connecting with me? Perhaps it is someone bored and wanting to chat. Perhaps it is a crude attempt to mine contact information from LinkedIn. But whatever the motives. This Mr Lavoie has been blocked, reported to LinkedIn and blogged about. Perhaps I should have taken them along a little further – just for the ride…. This entry was posted in LinkedIn, Scam and tagged cloned accounts, LinkedIn, phishing, scammers, Spam on July 3, 2013 by eileenb. Here’s another poor quality example of an attempt to extract information from my Windows Live account. This time my account has been blocked. What’s wrong with the email? It is in the wrong font. Microsoft usually sends email in san serif fonts. Link mismatch – phrealtyfunding.com. Ha! Eileen is a social business and social media strategist and consultant at Amastra, a columnist at ZDNet and author of Working The Crowd: Social Media Marketing for Business. Contact Eileen to find out how she can help your business extend its reach. 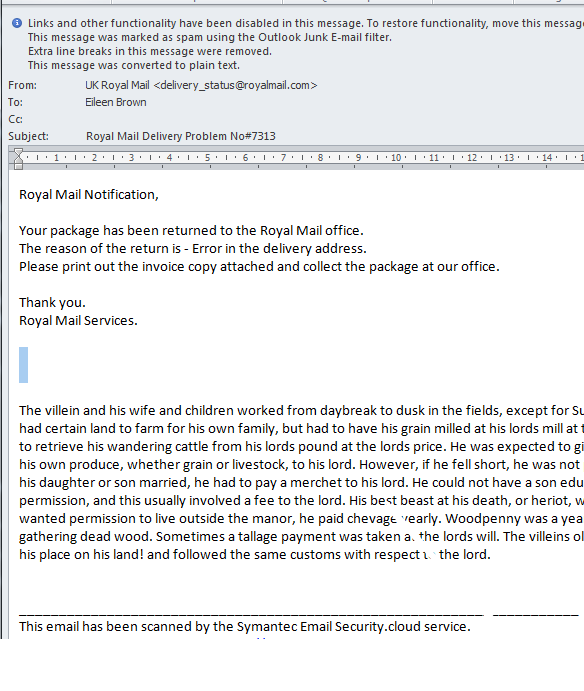 This entry was posted in Scam and tagged phishing, Scam, spammers on November 30, 2012 by eileenb. Hidden in the ‘story’ text is SQL injection code. If a website, or webmail system accepts scripts or codes, then the code hidden in this text can potentially execute if the Admin password is blank or ‘Admin’. The script can then take possession of the root of the machine, compromising security of the machine, removing data, accessing databases or turning the server into something that could be remotely compromised. Fortunately my hosted exchange server, recognised the attack and dumped the email into my junk email folder, displaying the text – which had been hidden in the top message. 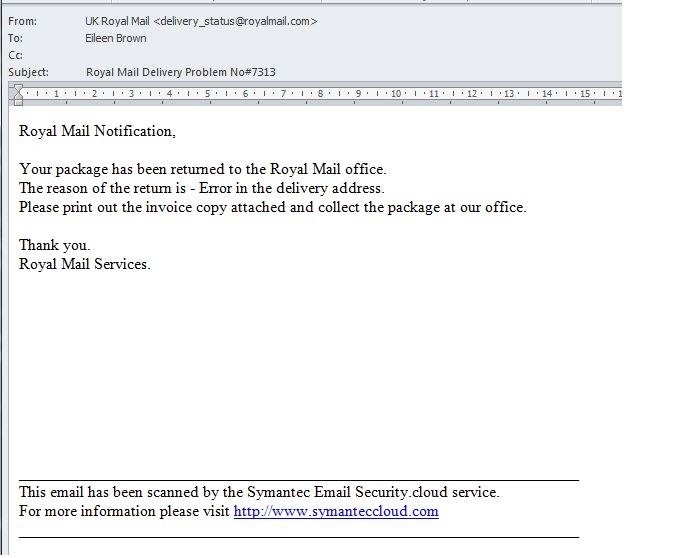 This entry was posted in Scam and tagged attack, malware, sql injection on November 6, 2012 by eileenb. $15,000,000.00 USD: We deal in GBP here – sorry. W-8BEN: This is a US tax form – and not used over here. email address ending in .vc. This is the email address for Saint Vincent and the Grenadines. Obviously not HMRC in the UK. Ms Lin Homer. You can keep the 15 million dollars you owe me – It looks like you need it to furnish your country home on the Islands. I’ll deal with my local HMRC thank you and get any payments due to me in British pounds. Eileen is a social business strategist, ZDNet columnist and author of Working The Crowd: Social Media Marketing for Business. Contact her to find out how she can help your business extend its reach. 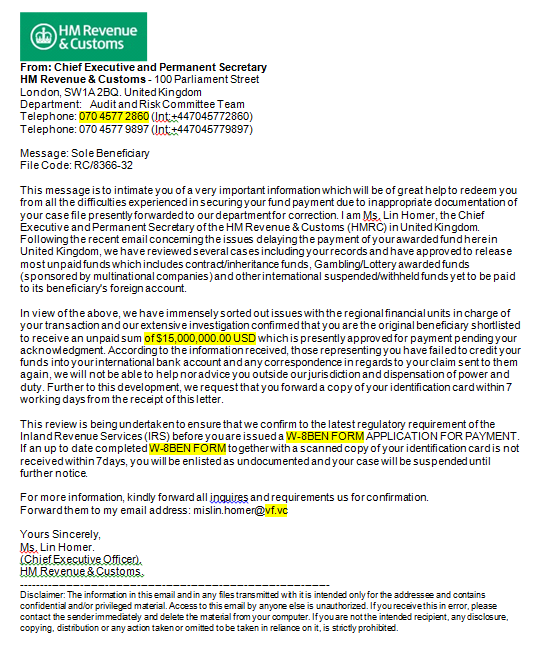 This entry was posted in Scam and tagged Scam, scammer, Spam on October 29, 2012 by eileenb. 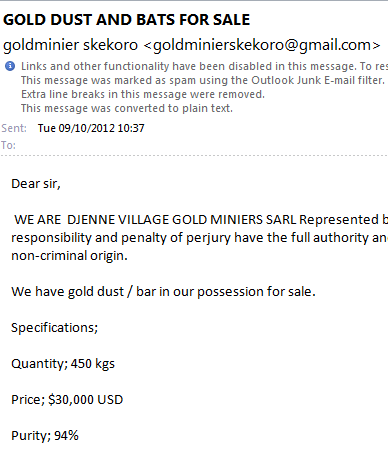 Gold Dust and Bats for sale: Scammer fail or not? This mis-spelled email was guaranteed to get my attention. Scammers and spammers often use this trick to lull the unwary into a false sense of security. We think that we would never fall for that sort of trick – but so many of us do. We believe that we are smarter than the scammer, we think they are stupid for their poor spelling and grammar. Beware of the bats and other spelling mistakes. you might just be falling directly into the trap that the scammers want us to fall into. This entry was posted in Scam and tagged god bars, Spam, spammer on October 9, 2012 by eileenb. I’m hardly going to click the link if when I hover over the hyperlink, I get a completely different URL to the one I was expecting. 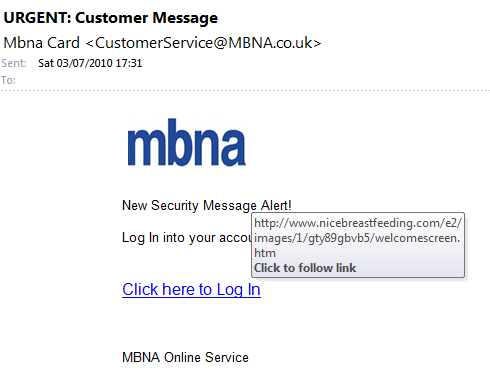 This entry was posted in Scam and tagged phishing, Spam, spammer on May 2, 2012 by eileenb.